Southampton, Itchen is a constituency in the city of its name in Hampshire. The seat was created in 1950. The current member of parliament is the Labour Party’s John Denham who has represented the constituents since 1992. As a long-term resident of Southampton, with my wife and children, I have worked here, been unemployed and have set up a company to promote energy saving for businesses. Southampton means a great deal to me, as I know it will to local people. · Financial. No pay and low pay lead to poverty. Greens will guarantee a minimum income for citizens and implement a living wage. This will banish poverty whilst ensuring that it is worthwhile for everyone to work. Big corporations and big earners must pay their fair share. · Environmental. The Earth is dying, pollution shortens our lives by years and bad damp housing is unacceptable. We must change all this. Please vote Green before it is too late for us all. · Health. We need to save the NHS. Helping people to help themselves is the secret to long healthy lives. Prevention reduces pressure on the NHS. · As Chairman of the cross-party Southampton ‘Yes to Fairer Votes’ campaign. In my spare time I write fiction e-books, including an autobiography (Abuse and Privilege). 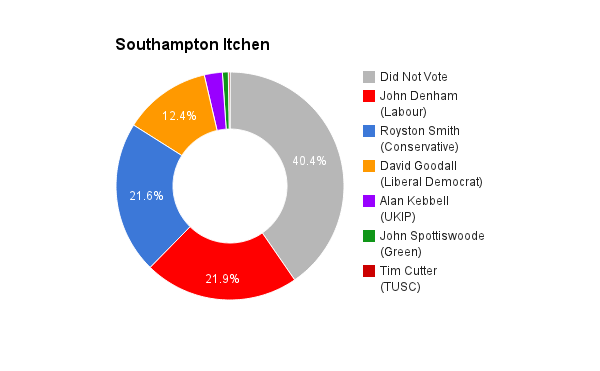 More people in Southampton Itchen support Green Party policies than any other Party’s policies (see voteforpolicies.org.uk). We can win if you vote for the policies you believe in. Regular meetings with constituents, not just for personal issue ‘surgeries’ but meetings to explain key decisions being made and to be open to constituent questions. Plus good on line accessibility and responsiveness. None of the other candidates take the threat to our future seriously due to massive climate change, massive loss of key resources, and a massive increase in pollution that threatens the very future of humanity. I promise to act on these things and to bring fairness to bear, by seeking to abolish poverty in Britain via a Citizens Income and Living wage of £10 ph by 2010. Plus making sure that big companies and big earners do not evade or use loopholes to avoid taxation. John Denham was one of the few to oppose the Iraq War and should be recognised for taking a principled (and correct) position. Austerity penalises the poorest and is very negative in its impacts. The 2008 recession was due to bank failures and NOT government overspending. The rich need to pay their fair share via taxation and austerity measures stopped. The effects of immigration must be dealt with so everyone in the UK is guaranteed a minimum income, and immigrants from the EU bring EU funding to pay for more services, such as NHS and schools. This can be corrected by implementing a living wage as the minimum wage of £10 ph by 2010. Also there needs to be a fundamental shift of wealth from the rich to the poorer sections of society via such things as a wealth tax. The NHS needs to be funded properly, kept public and not driven by the profit motive and therefore not privatised. More apprenticeships, a lot more investment in renewable technologies such as for energy generation, energy saving and into productive industries that build economic well-being for the common good. Yes. Y views, for instance, are represented by only one person in Parliament and for years there was no-one. We have a biased democracy that favours old fashioned established political Parties. The system needs to be changed to represent the wide variety of views. In favour of staying in the EU as we must have a cross-Europe approach to the big questions such as global warming, human rights, economic fairness and the like. However the EU does need to reform to devolve as much decision-making as possible to the lowest level, so for instance Britain should never join the Euro.